‘Epic Pop Guitars’ is a brand new sample pack that revolves around live-recorded guitar loops and elements to create guitar-infused pop and dance music. Create anything from summer house and mainstream pop to pop trap or let your creativity run free with this amazing library created by various producers. Choose any of the 120+ guitar melodies and riffs and use them as a basis for your new epic production. Covering acoustic as well as electric guitar loops and ranging from trendy to melancholic, this selection will dazzle and astonish even seasoned music producers with the sheer quality of recording. 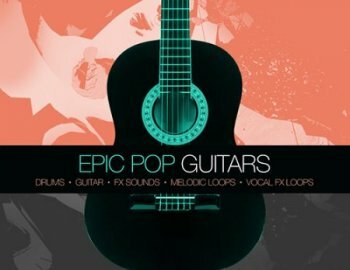 ‘Epic Pop Guitars’ gives you the tools necessary to lay down epic songs without ever touching a guitar! Showcasing a mixture of live-recorded and handcrafted drums and percussions, it’s easy to see that ‘Epic Pop Guitars’ isn’t just about the guitars alone. Play around with a plethora of kicks, snaps, full drum loops, single hit percussions, cymbals, tops, hi-hats and plenty more. When it comes to loops and one shots, ‘Epic Pop Guitars’ really brings the beats! Next to guitars and drums, you will find a variety of the smoothest and the most emotional harps, cellos and violins. On top of that, you can expect an excess of synth basslines and live-recording bass guitars. Last but not least, we also included a wide section of mesmerizing sublime effects and atmospheric vocals. Set the mood of your track by adding some fx or vocal elements and take your song to new heights! Get ‘Epic Pop Guitars’ now!